Maupintour is a worldwide, luxury tour company founded in the 1950’s in Lawrence, Kansas by tourism pioneer Tom Maupin and his partner Neil Mecaskey. By the 1980’s, they had grown the company into a multi-million dollar operation with hundreds of thousands of clients. Maupin & Mecaskey filled the company office in Lawrence with art and collectibles, including 5 antique wooden carousel horses. This information is for those interested in the Maupintour carousel horses and provides some basic descriptive information about them. For more information about carousels, carousel horses and their makers, please follow some of the links provided at bottom. 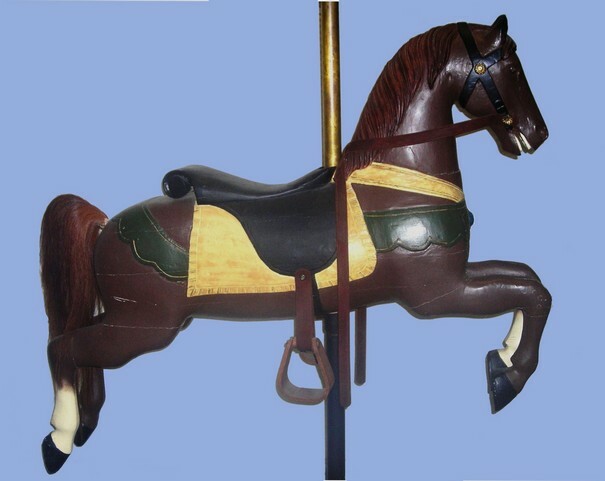 By accounts, Maupintour purchased its five carousel horses in 1981 and/or 1982. 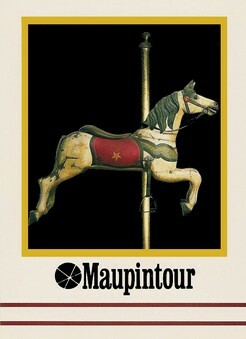 The Maupintour company Holiday card from 1984 has the Armitage-Herschell white horse on the cover, and an inside note in the card states: The antique carousel horse pictured on the cover still retains its original decoration. Created by artist Hershell (sic) Spillman, it was added to Maupintour’s corporate art collection in 1982. Several of these magical steeds grace Maupintour’s headquarters in Lawrence, Kansas. Also, longtime personal assistant to Neil Mecaskey, Marilyn Good, recalls assisting Neil Mecaskey purchase the horses circa 1981/82. The unsubstantiated (by documentation) information I’ve been told is that 10’s of thousands were paid for each of the horses! I always found that difficult to believe but realize it may have been possible, since the carousel horse market was at a peak at the time. It was prior to the internet and horses and sellers were much more difficult to find, and fewer carousels had been broken apart. The horses were displayed in Maupintour’s Lawrence, KS offices (2 separate locations) until late 2001, when they were moved to Maupintour’s Las Vegas, NV office. I purchased the horses from Maupintour in April of 2007. I believe that for Maupin & Mecaskey the horses represented what they represent for many people – a window back to happy childhood memories; symbols of pure happiness and fun. The fact that all the horses were County Fair style is likely no accident. County Fair carousel horses are the simplest, least adorned of carousel horses, designed for and used on small, portable carousels that were usually carted from one town and county fair to another. The other main carousel horse styles are ‘Coney Island’ and ‘Philadelphia’ styles and those horses and menagerie were much more elaborately decorated, and the carousels larger and made for more permanent installation. Regards the Maupin horses, Maupin & Mekaskey were both born (in the 1920’s) and raised in the Midwest. Maupin in small-town Oklahoma and Mecaskey in Kansas City, MO. 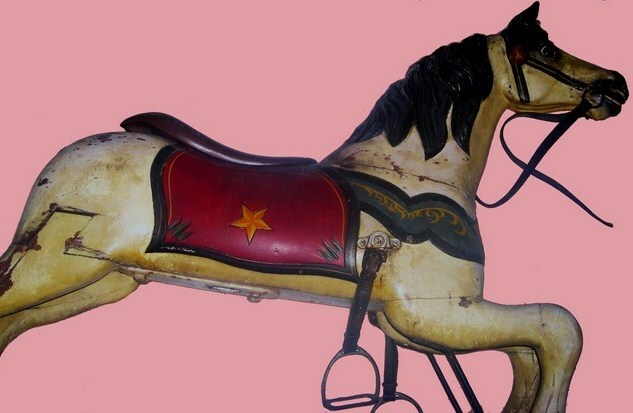 Although this time period is towards the end of the traveling carnival heyday, it is likely that they rode quite a few county fair style horses during their youth. Although, as adults, Maupin and Mekaskey’s travels literally spanned the globe, and they had a brownstone and social connections in New York City and a strong appetite for modern art, it is quite reasonable to believe that it was the simple county fair carousel horse that most fulfilled their youthful memories. and represent a nice variety of makers within the County Fair style. Each has its own charm & interesting features. There are two Armitage-Herschell jumpers, circa 1898. They’re well-worn but still have their original factory paint! They’re black and white twins, and I call them White Star and Black Beauty. The Herschell carousel companies, based out of (upstate) N. Tonawanda, NY, were the most prolific and long-running of the county fair carousel makers. There is a second set of twins, two U.S. Merry-Go-Round Co. jumpers, circa 1890’s (This time estimate is based on comparison to the All Hallows Guild Carousel horses at DC’s National Cathedral – see www.nca-usa.org/psp/WashingtonNationalCathedral/ ) These horses are in excellent condition and very rare. 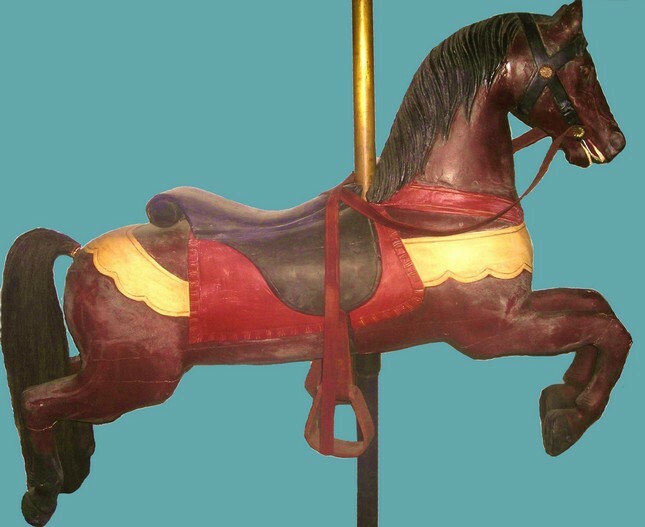 There are only two carousels still operating with U.S. Merry-Go-Round Co. horses. U.S. M-G-R Co. was the most known of a few carousel makers located in Cincinnati, OH around the turn of the century. The fifth horse is a Charles Dare jumper, circa 1880’s. Charles Dare, who operated from New York City, is considered the ‘father’ of the county fair carousel horse style. The county fair carousel makers that followed him basically copied his horses with a few minor indentifying differences, such as that Charles Dare is the only maker who carved martingales on the breasts of all his horses. The MaupinCollection Charles Dare horse now resides in my dining room, and my children have affectionately named her Sandy. 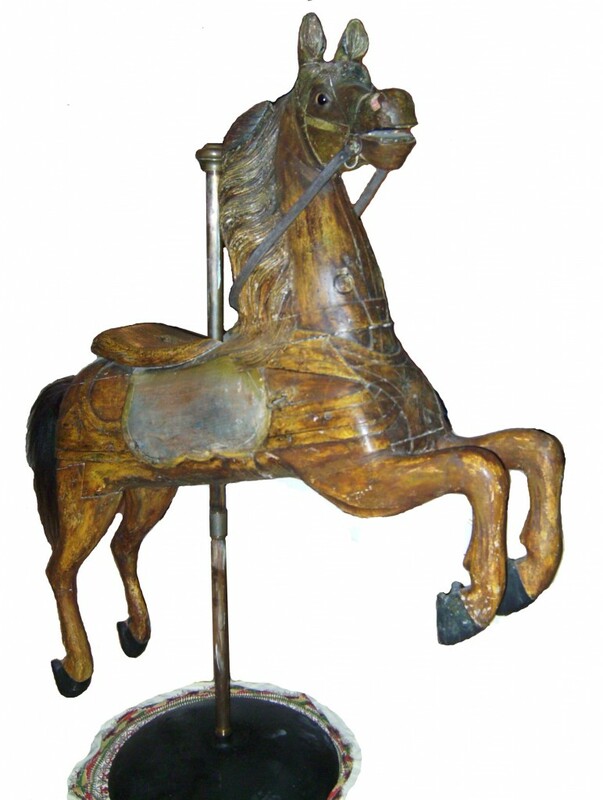 Armitage-Herschell carousel horse, circa 1898. "White Star"
I had first believed that these horses were from the Herschell-Spillman era of the North Tonawanda, NY Herschell carousel company timeline, circa 1900-05. Apparently, Maupintour believed this to be the case, based on the note in the 1984 holiday card, and listings in a 1998 appraisal. However, I am now convinced these are Armitage-Herschell, circa 1898, as identical horses at the Faust County Park Steam Riding Gallery in Chesterfield, MO are listed as such. These Armitage-Herschell jumpers are twins except for decoration and various wear differences. The most notable factor about these particular horses is that, as stated on the 1984 Maupintour Holiday Card, these horses are wearing their original 110 year old factory paint! The charm this adds to these horses is amazing. 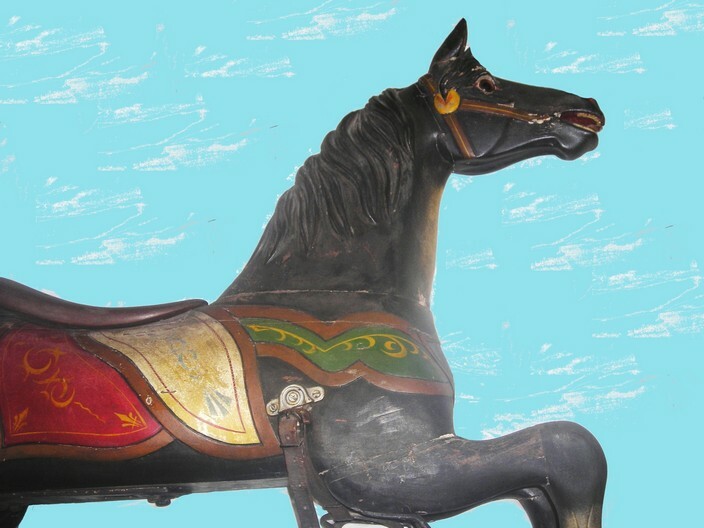 Armitage-Herschell carousel horse, circa 1898. "Black Beauty"
These horses have flowing manes and sweet, eager faces. As to be expected with 110 year old carousel horses that have apparently never been refurbished or restored, there are some condition issues. The white horse has a loose back right leg. This appears visible in the 1984 card and was also noted in the 1998 appraisal. Both horses have paint cracks and flaking to various degrees. However, much of the decoration is in good to excellent condition. 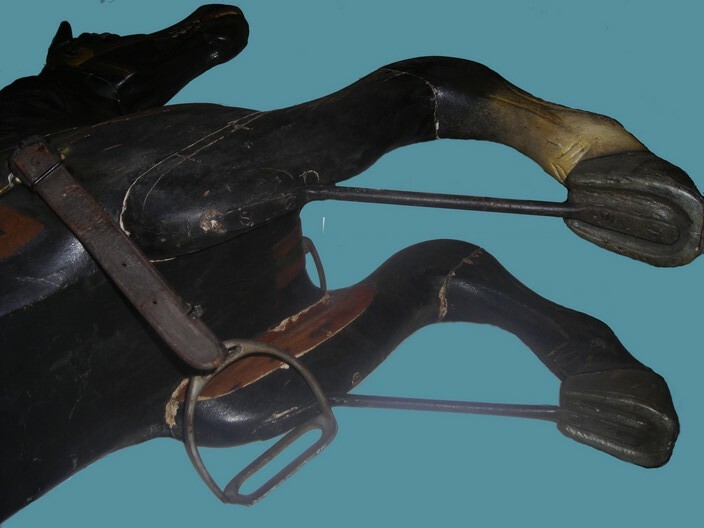 The black horse is missing small (whole) pieces of wood from its rear underside (see picture above, missing piece evident by unpainted surface.) These wood pieces likely came off when the horse was removed from the carousel or other support. It does not seem to affect the strength of the horse or legs and is not noticeably apparent when viewing the horse from the side or above. The black horse also has damage to the top right side of its mouth and is missing the round rein strap holders (compare to white horse.) The damage to the mouth appears old, and while somewhat substantial, it is not noticeable when viewing the romance (right) side. Size: 63” measured diagonally from nose to back hoof. The 2nd set of twins are two U.S. Merry-Go-Round Co. horses, both jumpers, identical except for decoration. They both have chocolate-brown park paint and black saddles. 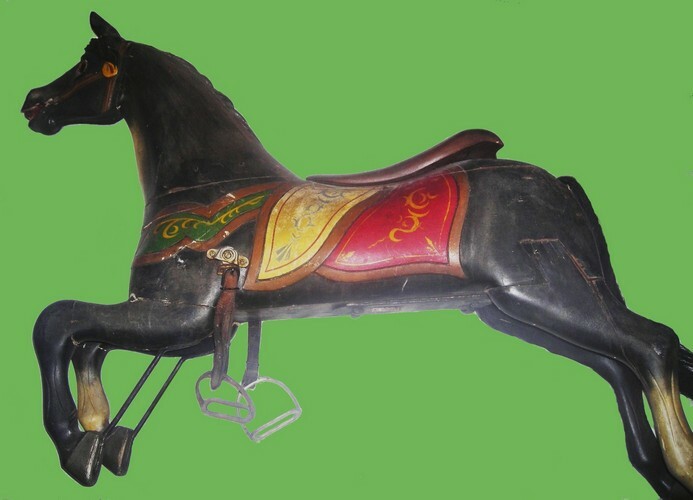 Both have U.S. Merry-Go-Round’s simple, but distinctive scroll carved at the rear of the saddle, as well as leather and wood stirrups, and brass rosettes at their bridle connections. One horse has dark green decoration and a cream-colored saddle blanket and the other has cream-colored decoration and a red saddle blanket; I call them, simply, ‘Green’ and ‘Red.’ Green has a brown mane tail and white markings on two legs, and Red has a black mane and tail and black markings on its hind legs. 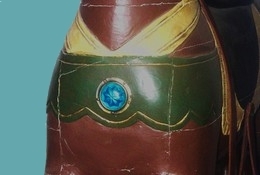 Green also has a 1½” diameter azure blue jewel affixed to its breastplate. They are both in excellent condition, with no to negligible seam separation and only minor other condition issues like paint cracks at the seams. Both horses are still ridable! They have large and full natural horsehair tails, and leather bridle / seatbelt straps. Each is mounted on a matching brass and steel pole with a quad-leg, X-shaped base. Size: 64” measured diagonally from nose to back hoof. Sandy has the tell-tale Dare martingale running up her chest and neck, with round strap-holders on her neck at the top of the martingale and the round strap-holders holding a bridle at mouth. Has hardware on front sides for stirrups, but no stirrups. Upon purchase in 1981, Maupintour had a Kansas University art professor complete an “artistic refurbishment” of the horse, leaving it with a natural, unpainted, but glossed, finish. The goal of the refurbishment was apparently an aesthetic treatment to enhance an aged, natural appearance, as opposed to restoration. While the horse seems structurally sturdy, meaning it has no hanging pieces or imminent breaks, there is visible seam separation throughout. Since as a whole the horse is sturdy, this was likely an artistic decision, and all areas have been strengthened to remain as they appear. There are numerous crude wood fillings and surface imperfections throughout, but from a small distance, with the glossed, natural finish, these do add to an overall successful, natural charm. The horse has wood horse shoes which I suspect were also part of the 1981 refurbishment. 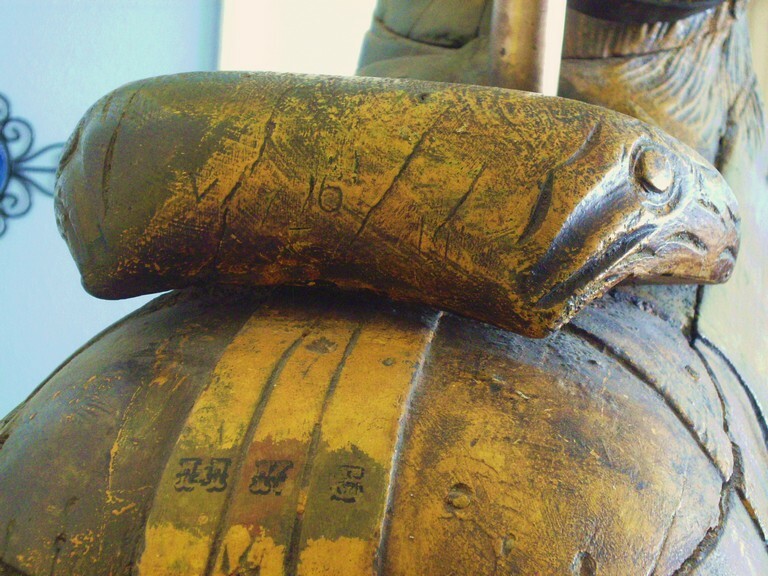 Although the horse was most likely originally carved without a thru-pole, at some point a hole was drilled through, as shown in the pictures. This resulted in a small portion of the front saddle now missing at the top front, to the right of the hole. 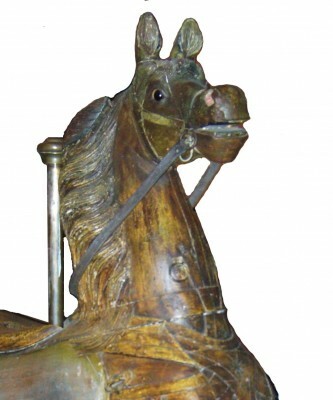 The horse has a mostly-full, natural horsehair tail in fair condition and is mounted on a brass pole with a large round metal base. Despite the flaws mentioned, this horse has considerable appeal, thanks to the natural finish and, of course, the happy and playful Dare face. An intriguing mystery from the refurbishment is that three stamped-ink monogram letters, U K G (or U K C), were left carefully unfinished on the rump above the tail. I’ve as yet been unable to determine who or what these initials refer to. Also note the VI 16 carved on the seat back. Carousel 6, Horse 16?